Again, this will go better if you’ve read part 1 and part 2 of this series! We’re going to combine two techniques here. 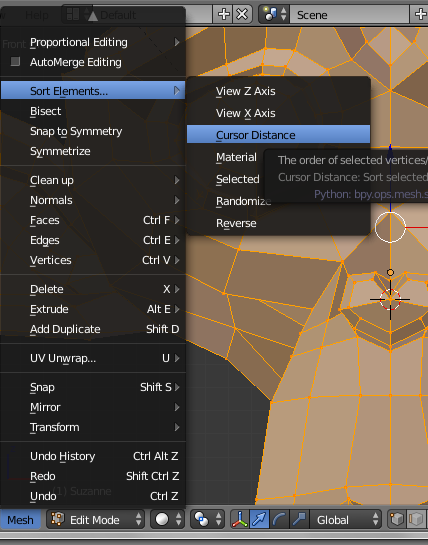 First, we’ll use the “Sort by Selection” method to order the vertices. 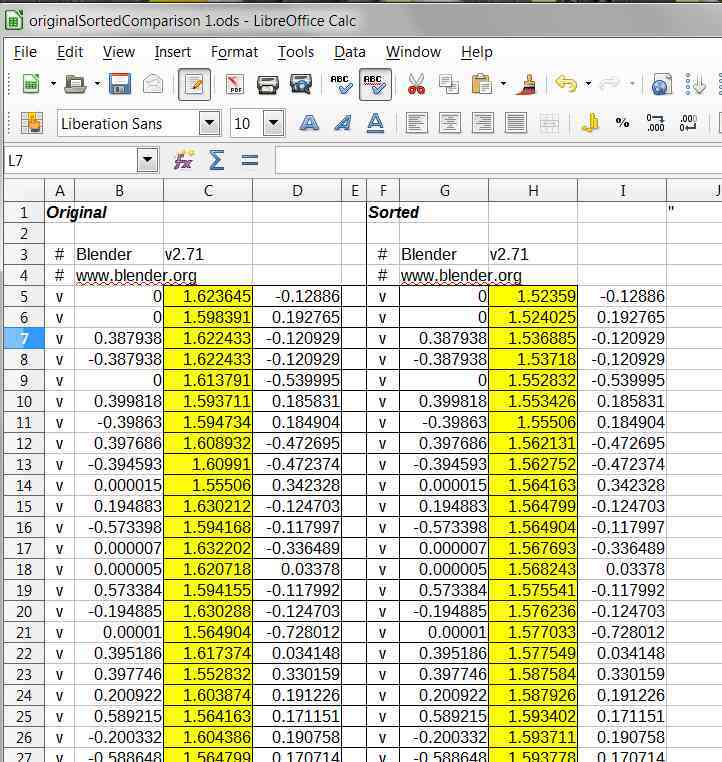 Second, instead of using a text editor, we’ll use a spreadsheet to manipulate the data!! We’ll use Suzanne, once again, as our model. 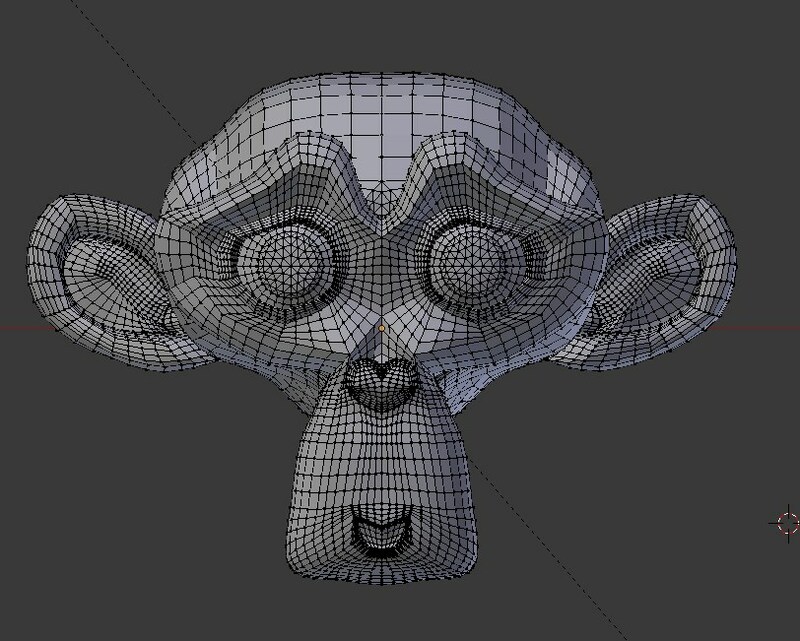 We’ll go into “Edit” mode and subdivide the mesh a couple times so we have more vertices to work with. That accomplished, we’ll select a few of the vertices at the top of Suzanne’s head, and, after that, we’ll go to the “Mesh” menu, choose “Sort Elements”, and then sort by “Selection”. Using the “visualize vertices” addon that we introduced in the last set of notes, we can now see that the vertices we selected are in indices 0 through 48 ( a total of 49). 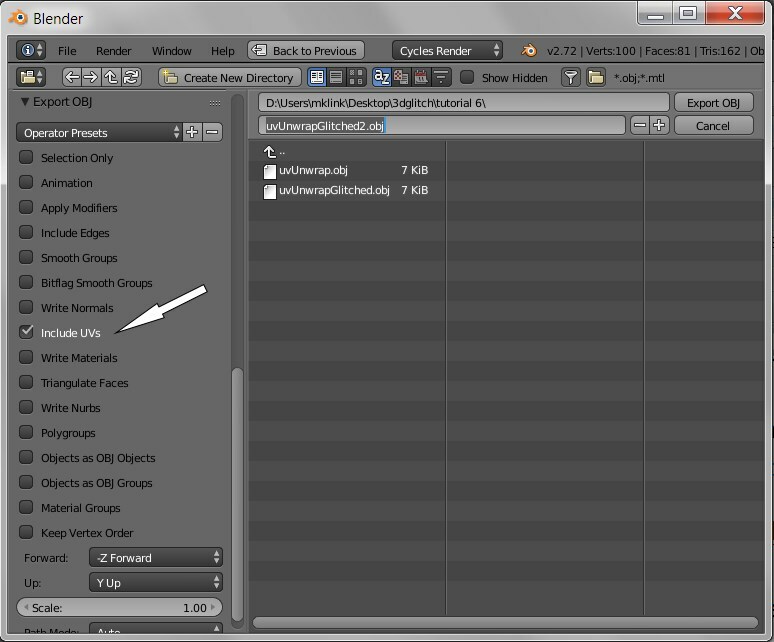 We then export the mesh in our usual fashion as an .obj file, change the extension to .txt, and open it in a spreadsheet! 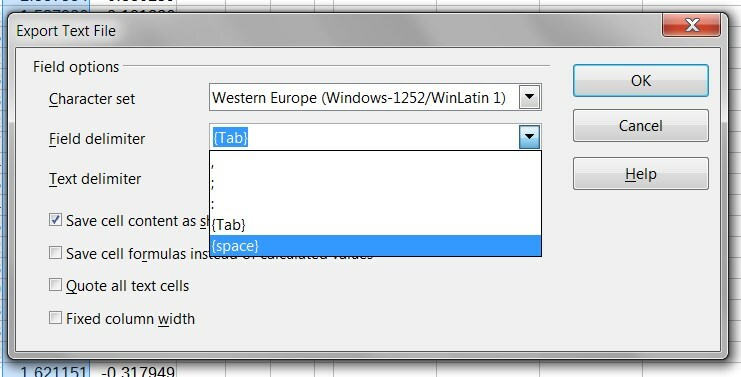 I’m using LibreOffice Calc, so I’m given the option of using spaces to separate the fields, this results in the x,y, and z coordinates being placed correctly in their separate columns. In this case, sort Column “C” by “Ascending”. 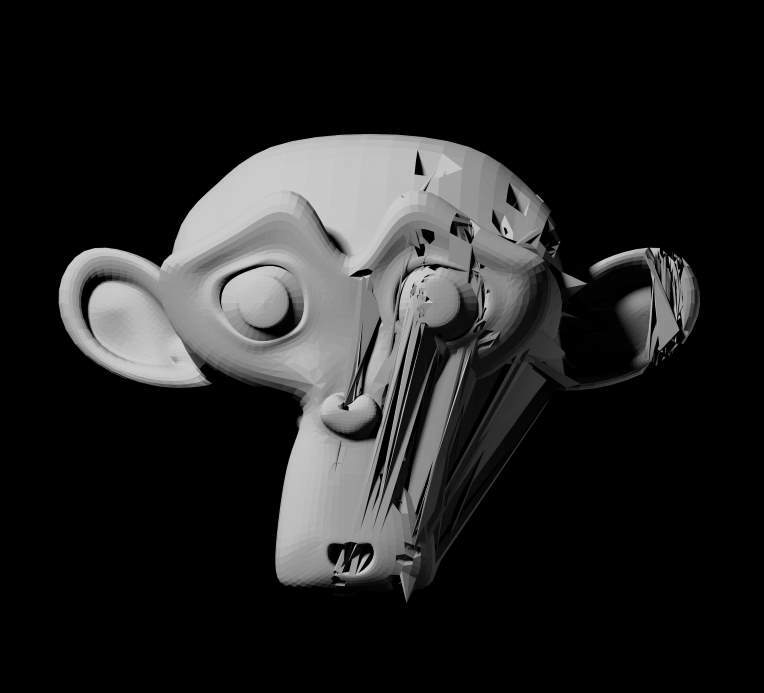 We’ve now “glitched” our file, but we have to take special care when saving it and changing it back into an .obj file. 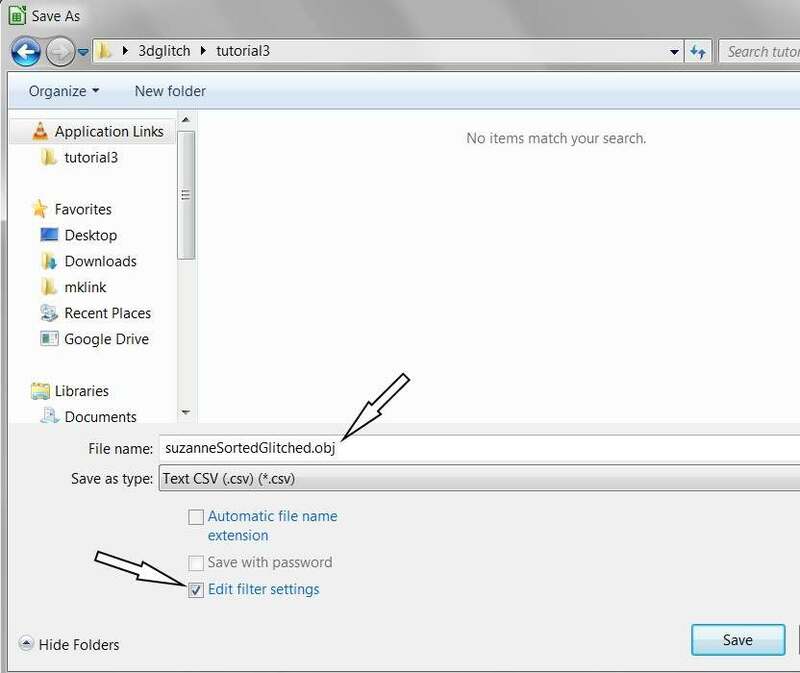 Choose to save as a text “.csv” file. In Calc, you’ll need to check the “Edit filter settings” option. You can also uncheck “Automatic file name extension” options, and then change the file extension from “.csv” to “.obj”. Look at that strange regular pattern of peaks and valleys on top of Suzanne’s head! What is happening here? Note that before we did our sort in the spreadsheet, the vertex at index 0 (on line 5 of the spreadsheet due to the header info above it) would be at the very top of Suzanne’s head.. at the highest “y” position. 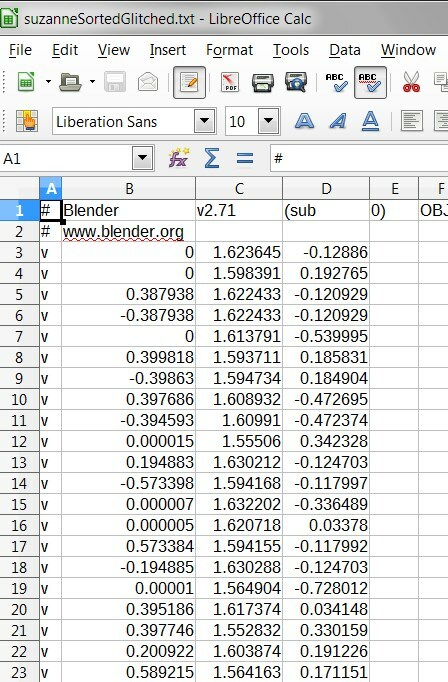 After we sorted the “y” axis in the spreadsheet in ascending order, that 0 index vertex was now at the lowest position on the “y” axis relative to the other vertices we selected. Each of the subsequent vertices we selected would be at the next slightly higher position, and the last vertex at index 48 will now be at the highest relative position. Note how the pattern skips, hopscotch fashion, so the next indexed vertex is never immediately “spatially” adjacent in the mesh to the vertices that are just before and after it in the index order. The “hopscotch” arrangement of the vertices results in the regular “high-low” alternation along the “y” axis that we see saw above. After the sort in the spreadsheet, the vertices reached during the first half of the traverse have all been assigned the lowest “y” values, and the vertices spatially in between them on the mesh, being visited last, have been assigned the highest “y” values. Of course, the order of the indices would have been different if we’d chosen a different method of sorting them back when we were in Blender. 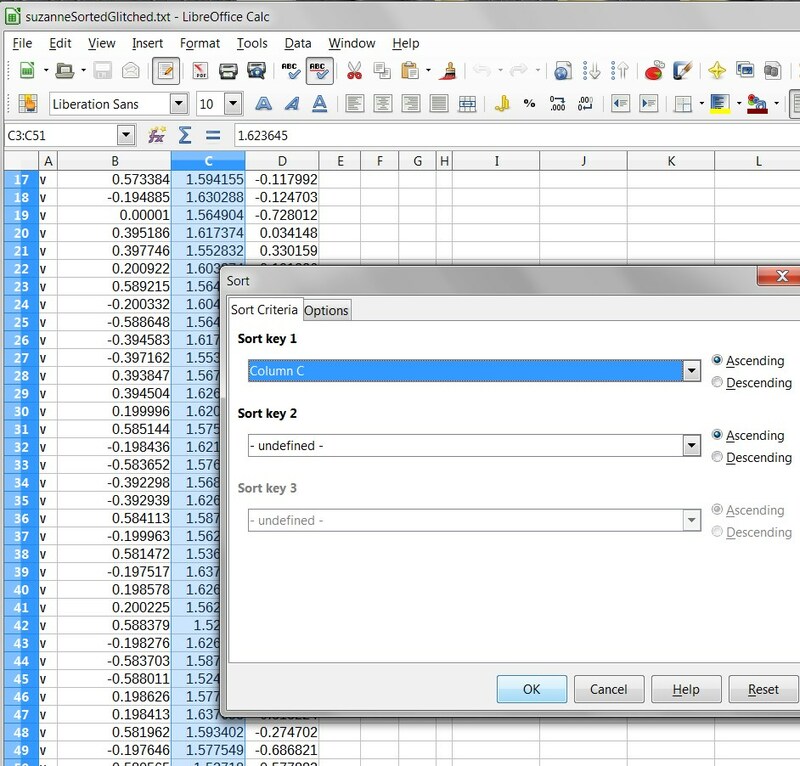 There are many other curious things one can do with spreadsheets.. easily cutting and pasting between the columns, applying formulas.. however, sooner or later the limitations of spreadsheets will get in the way. At that point we’ll need to use a real scripting language to manipulate the date.. but that will come in a future post. Before that, though, we’ll be looking at glitching the texture coordinates of the .obj file.. these control how a 2d image is mapped to the 3d surface of the mesh.. and now you’re ready to move on to the next section! 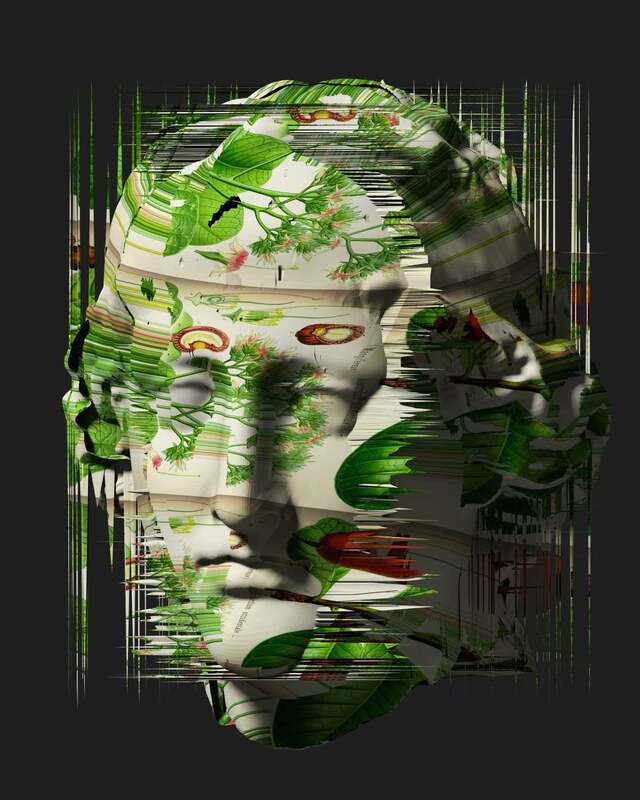 If you haven’t already.. be sure to read the first part of this series: 3d Glitching Part 1. 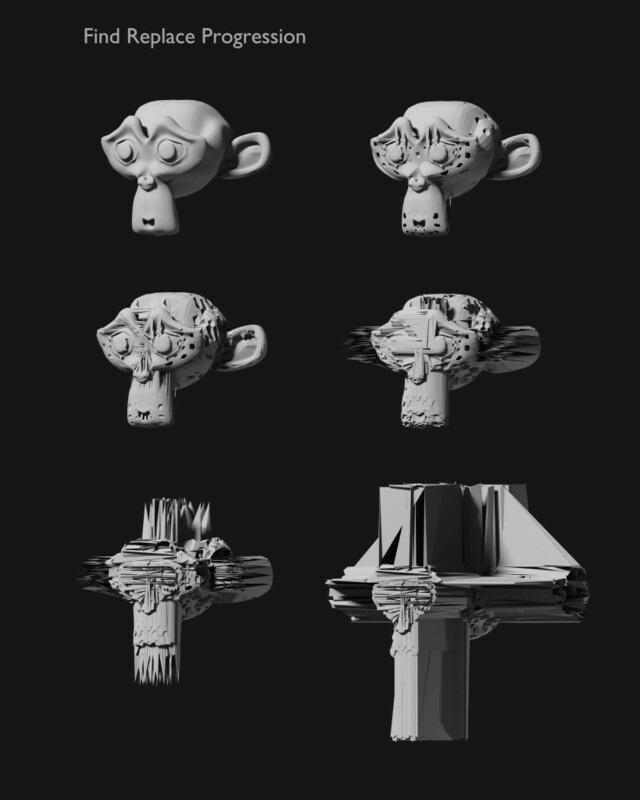 These notes assume that you already have an understanding of the material presented there, as well as an understanding of 3d modeling and the basic ideas behind “Glitch Art.” In addition, some knowledge of the 3d modeling and rendering program “Blender” will be useful, since it will be the tool we’ll be using. 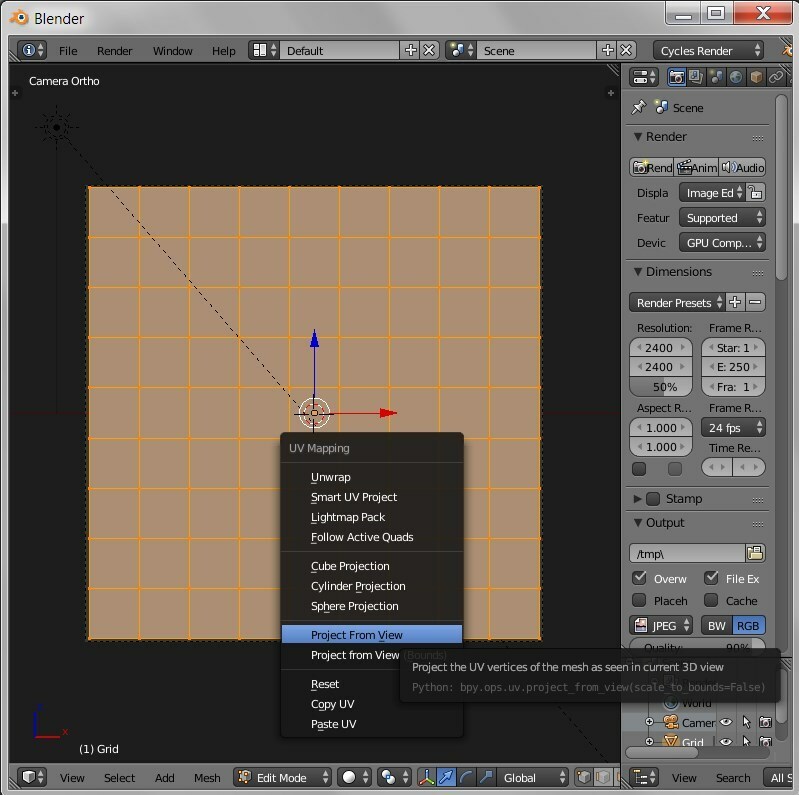 We’ll be dealing with some of the more arcane features of Blender … I’ll sometimes provide a little extra explanation of Blender terminology in hopes that it will make it easier for users of other 3d modeling/rendering programs to follow and to make adjustments for their preferred environments. This second set of notes provides a way to have some control over which areas of the model are “glitched.” As it is, the long list of vertices in an object file provides little information about what part of the model will be effected when we apply any of the techniques mentioned in part 1 – copy and paste or find and replace… If the model was exported from Blender, the x, y, and z axis are likely all on a scale from 0.00000 to 1.00000 or -1.00000. If the information on a line for a particular vertex contains the coordinates -1.000000 -1.000000 1.000000, it might be at the extreme left, front, and top of the object (which coordinates are situated in the “minus” direction and which axes are”up” or “forward” depends on certain options chosen at the time of export.) 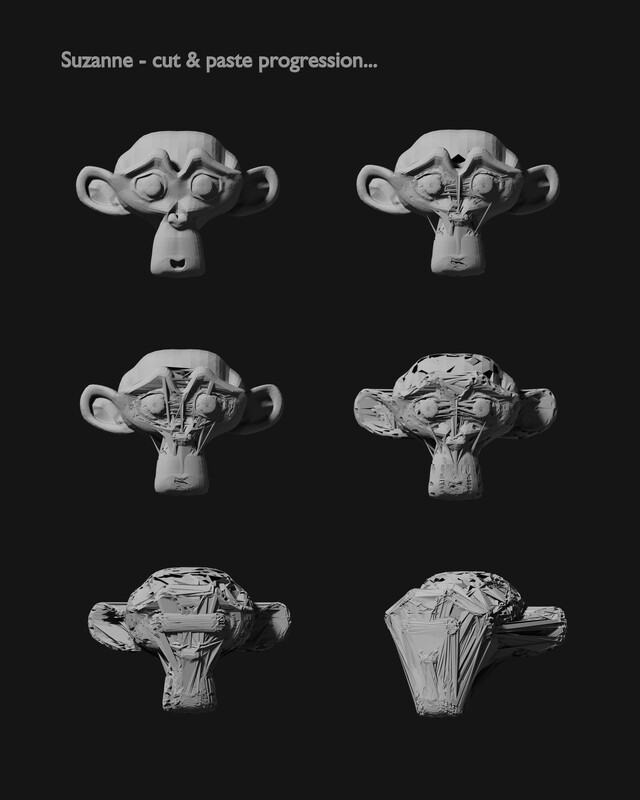 However, the lines containing the positions of vertices and faces for an .obj file are often sorted in unpredictable or even completely random ways. 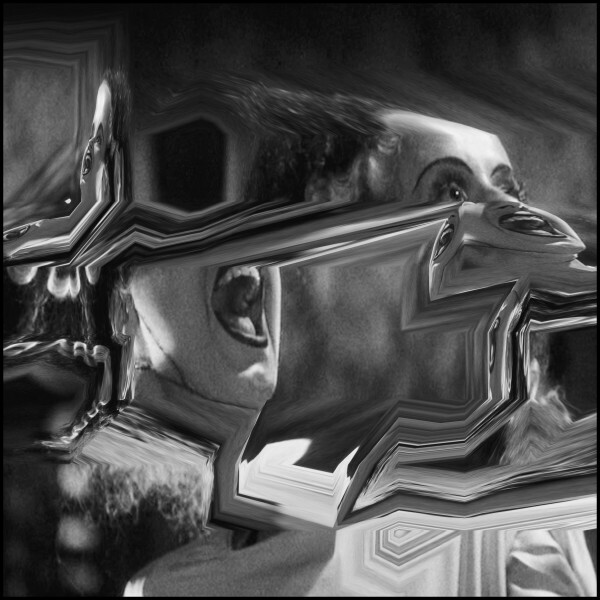 Usually this is just fine.. it’s that unpredictability that makes glitch art so much fun! 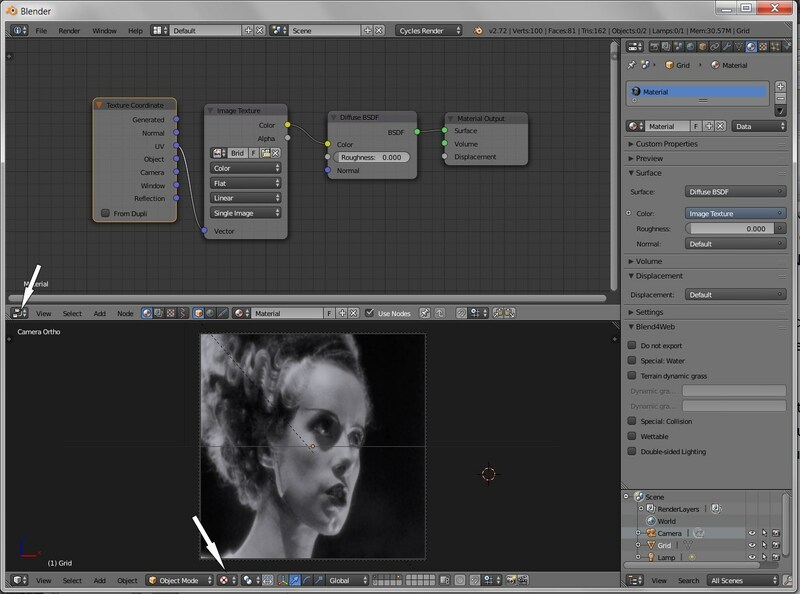 Blender provides a way to do just that. Within Blender we can choose to sort the vertices using several methods. 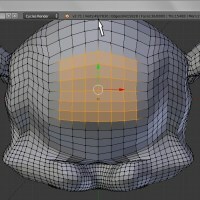 Once you’ve sorted the vertices, when you export the model as an .obj file and open it in a text editor, you’ll find the vertex you’ve chosen as the starting point for your sort at the top of the list, with the remaining vertices more or less ordered according to their distance from that first vertex. If you want to “glitch” the area closest to that first vertex, then you copy/paste, etc. near the start of the list. If you want to avoid glitching that area, you perform your manipulations elsewhere in the list. 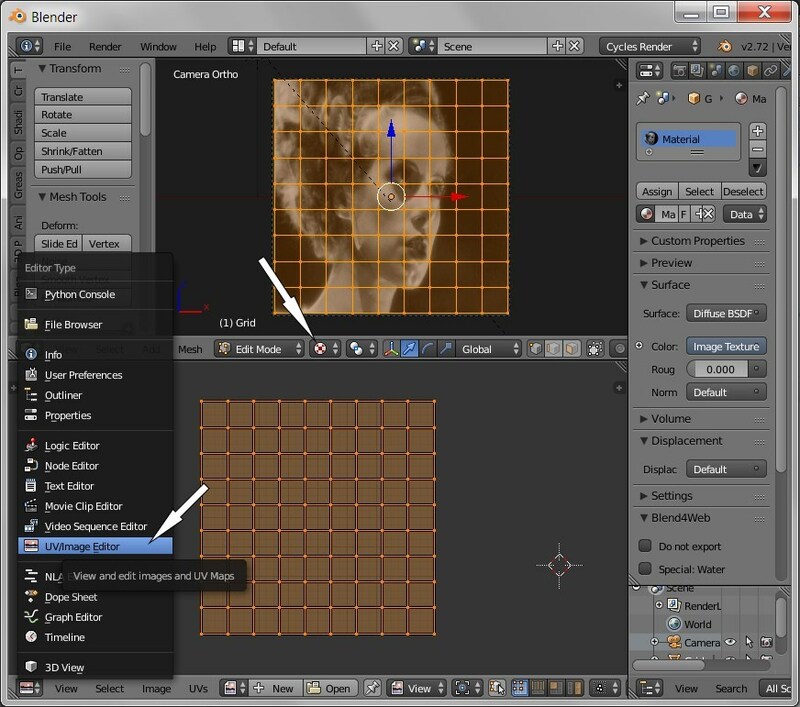 After having imported or created a model in Blender, go into “Edit” mode. 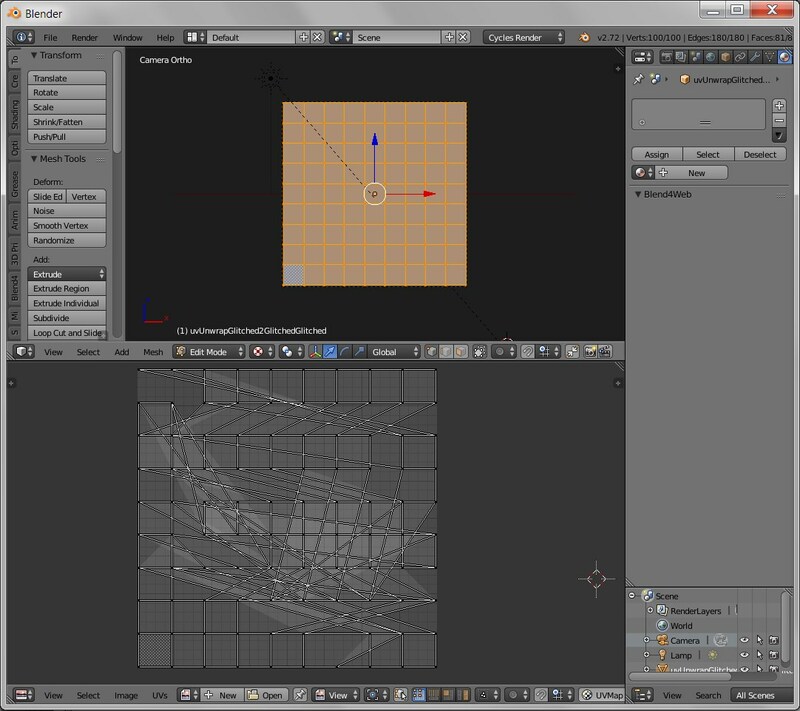 In Blender terminology that is when we can see and edit the individual vertices of the model. 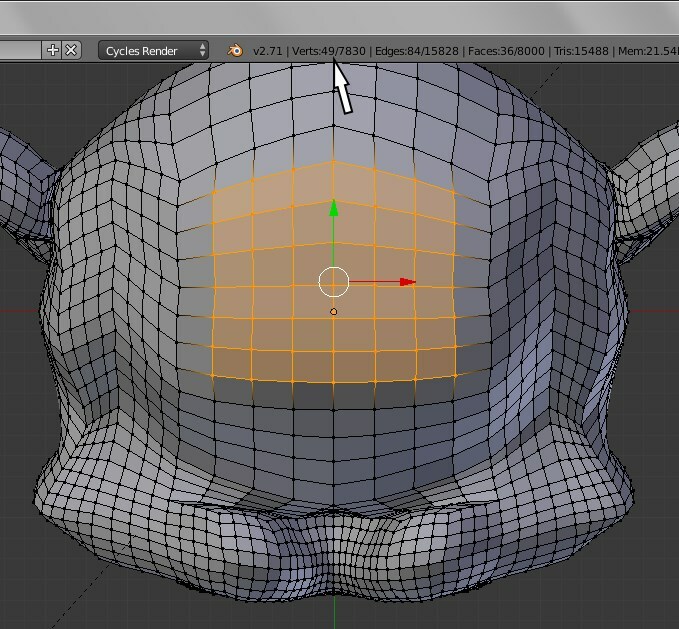 We’ll start by positioning the 3d cursor. 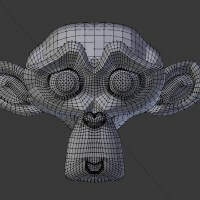 You can simply place the cursor where you like by left-clicking with the mouse, but if you want it to align precisely with a particular vertex, select that vertex (using right-click) and then follow with the shift-s key combination to bring up the “Snap” menu, and choose “Cursor to Selected.” Since we’re using Suzanne the Blender monkey for our model, let’s align the 3d cursor with the tip of her nose. Once you’ve installed and activated the addon, you can go to the “Properties” panel, and then find and press the “Visualize Indices” button. You should then see the index of each vertex. 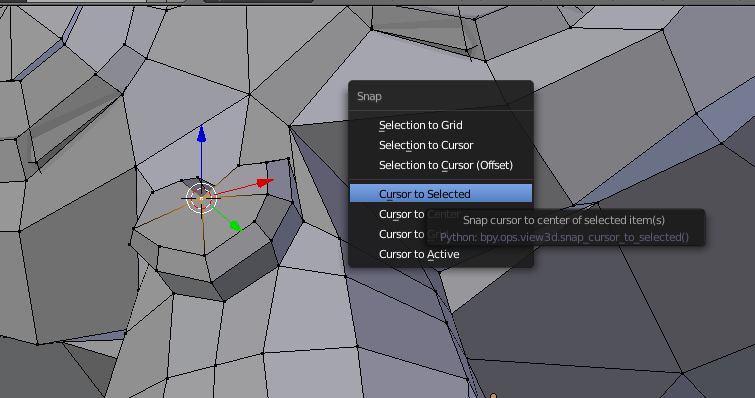 I recommend that you choose the “Selected Only” and “Vertices” options so you can limit the information displayed. Otherwise the screen will be unreadable when dealing with a heavy mesh! 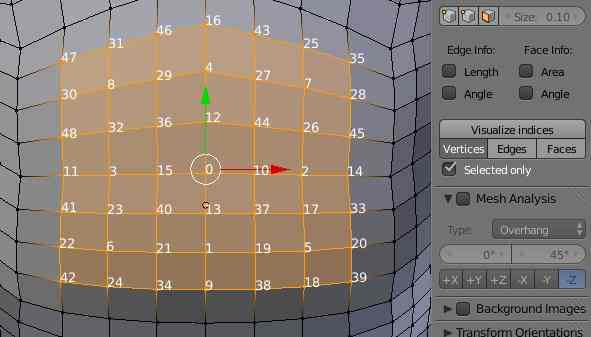 You’ll note that the vertex at the center of Suzanne’s nose has an index of 0 – That’s the vertex we used to position the 3d cursor. Don’t be confused by the appearance of index numbers that may seem to be in the “wrong” location, such as the “28” and “25” in the illustration above. the system displays the index numbers of vertices that are actually farther away, even when those vertices are hidden behind nearer polygons. That’s it for today.. You are now ready to move on to part 3 of this series! These notes presume that you have a basic understanding of glitching and of computer 3d modeling. 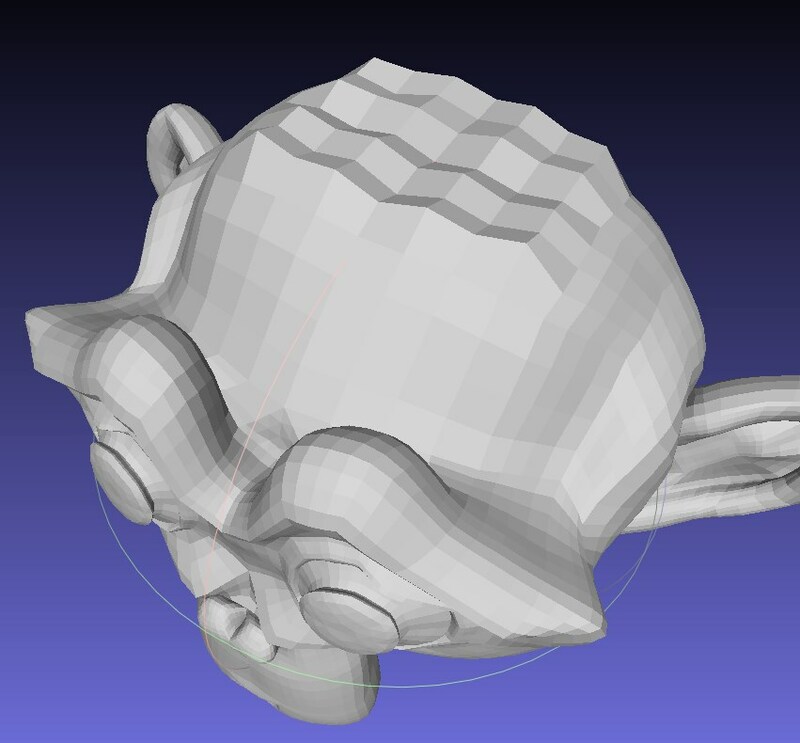 Instead of using standard 3d modeling tools to modify a shape, we’ll be directly manipulating the data in the file. Sometimes glitch artists employ a hex editor to accomplish this, but since the 3d file format we’re targeting is in ascii text, an ordinary text editor will do. 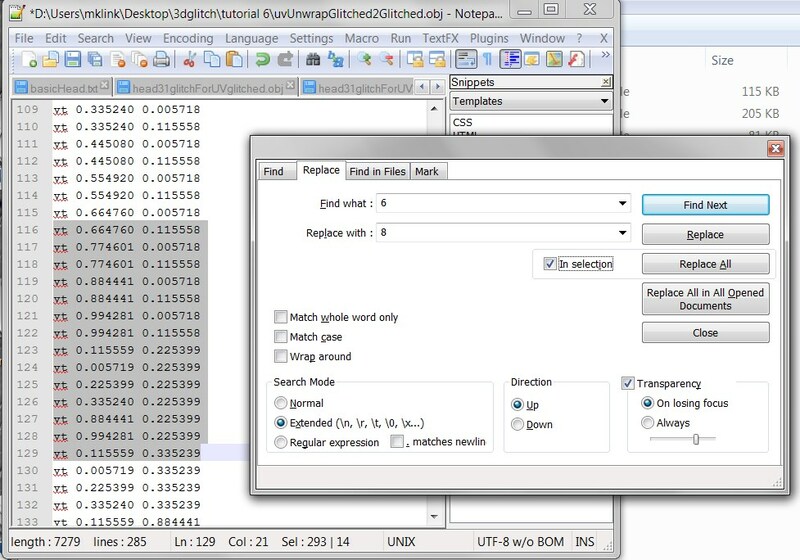 We’ll be using the Wavefront .obj file format. Models in this format are readily available on the web. 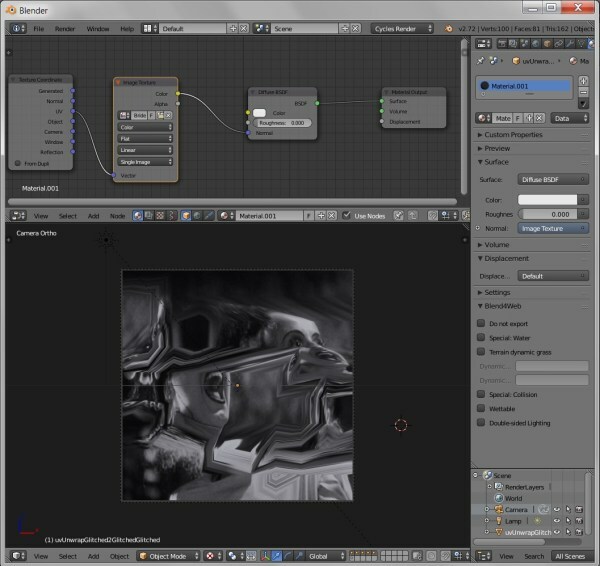 However, I recommend that you use the open source modeling and rendering application Blender to either generate your own models or to simplify third party models. 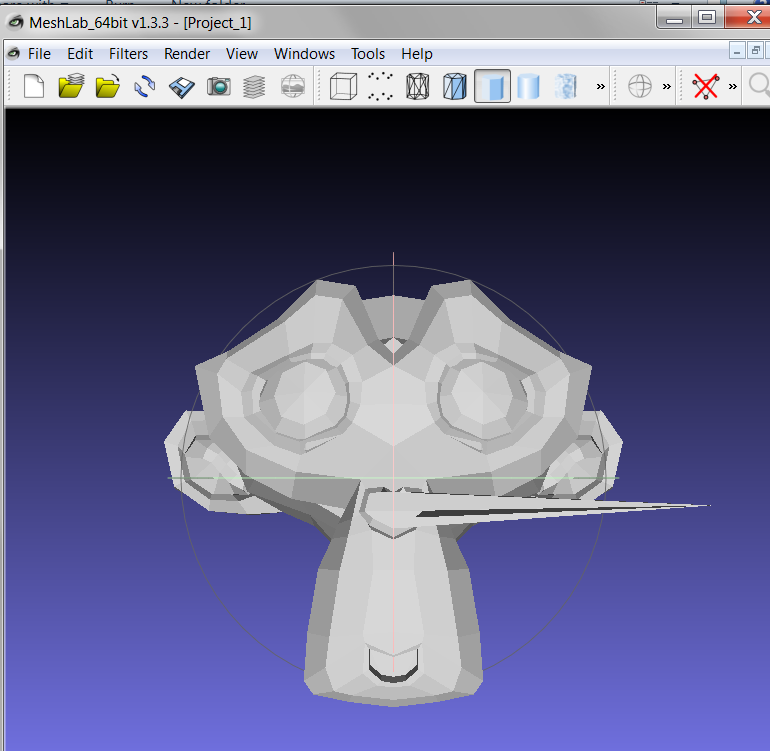 Alternately, you can use Meshlab. In Blender, export the model as an .obj file, but turn off all of the options – UVs, Materials, Normals, etc. etc. In Meshlab you will have similar options when exporting a mesh – we want only the most basic geometric information. Once you have your file.. use your favorite text editor to open it. I’m currently using Windows, so the editor of choice for me is Notepad++. 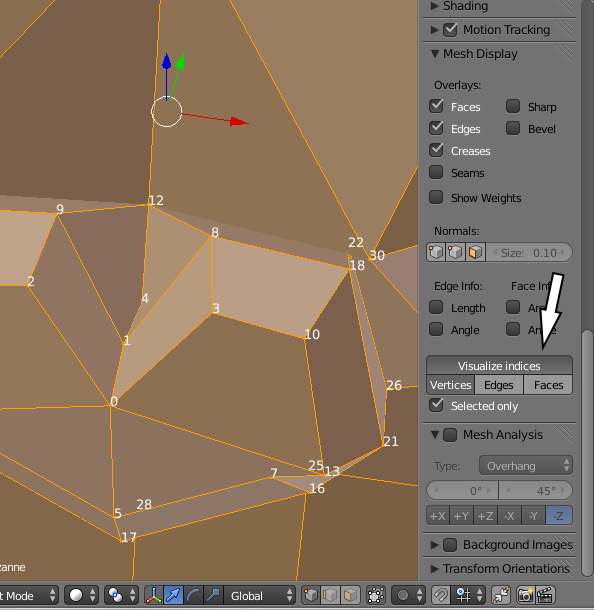 Next comes a list of polygons, referred to as “faces”, one on each line that begins with an “f”. In our example the faces are quads since they have four integer values, each integer indicating a vertex from the first part of the file. The integer corresponds to the index of the vertex. For example, the first quad of our cube is made up of the 5th, 6th, 2nd, and 1st vertices in the list. This structure will have important consequences when we begin to “glitch” the data. 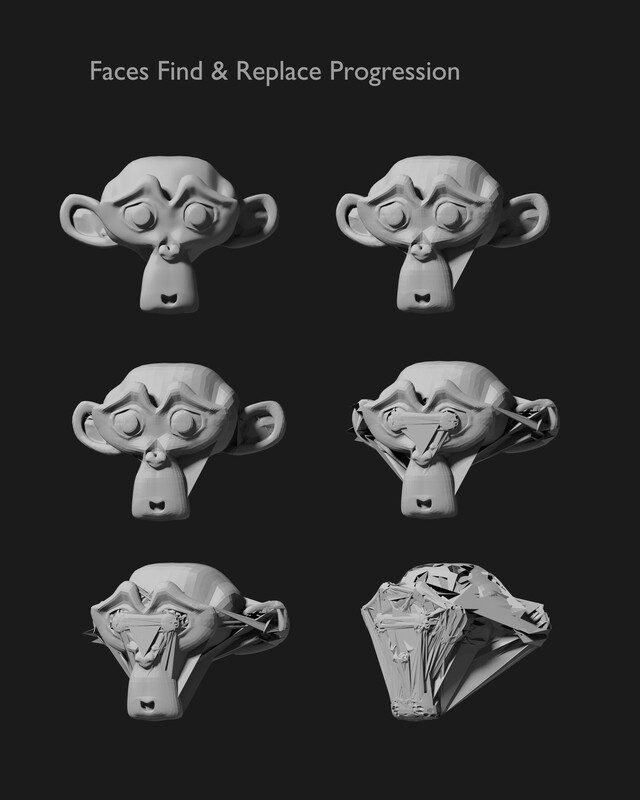 We’re using the famous Blender “Suzanne” monkey head as our model. Successive versions represents more drastic applications of cut and paste. At the beginning we use smaller snippets and paste them at positions that are closer to their original location. Later in the series we cut bigger chunks and paste them much farther away from their original location. Note that replacing a larger number with a smaller number generally results in a vertex that is inset.. that moves closer to the origin (assuming that the origin is at the center of the object.) For example, if we replace “8” with “2”, a vertex that was at Y axis -0.8 is now at -0.2, and a vertex that was at Y axis 0.8 will now be at 0.2 – in both the negative and the positive case the vertex ends up closer to the origin. Conversely, replacing a smaller number with a larger results in vertices that are farther away from the origin. Another option is to change the part of the list that contains data for the faces. 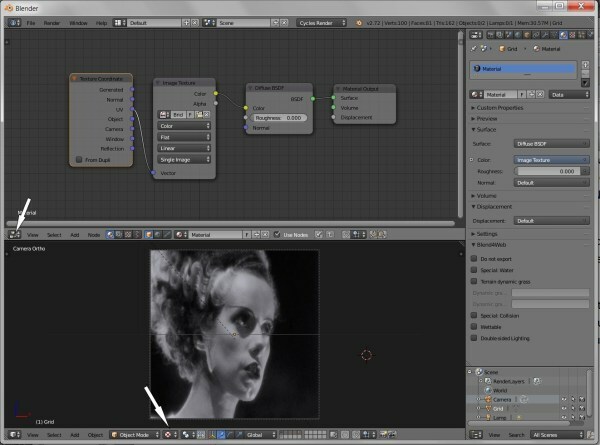 Cutting and pasting whole lines for each face will not have any effect.. it doesn’t matter what order the faces are in! If they refer to the same vertices they did before they will look exactly the same. Finding and replacing integers within the lines will have an effect.. but you must be careful! This is where you are more likely to make the file unreadable… be sure that the result of your “find and replace” is not a reference to a vertex that does not exist. Recall that the vertices are indicated by their index number. If you have 1000 vertices and you replace “1” with “9”, you’ll end up with a reference to a non-existent vertex at position 9000. You should be safe if you always replace a larger number with a smaller number. (This is an area where a more intelligent script would be useful.. but that’s a topic for another day..) Here’s an example of finding and replacing the data in the “faces” section of the file.. as before, there’s a progression from fairly limited to more drastic replacements. 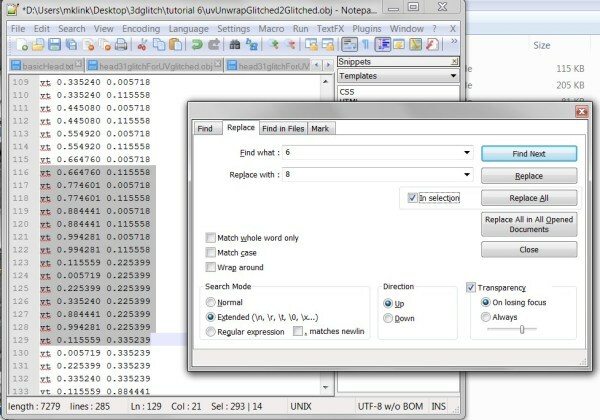 Obviously, one can combine all three of these techniques when “glitching” the file. There are more advanced methods. 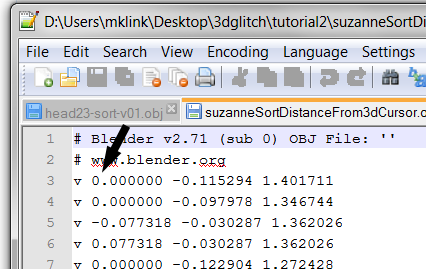 In Blender one can specify a vertex that will be the starting point for sorting the vertices. Thus one could force the vertices at the tip of Suzanne’s nose to come at the start of the list. This allows some control of where the glitching will take place. 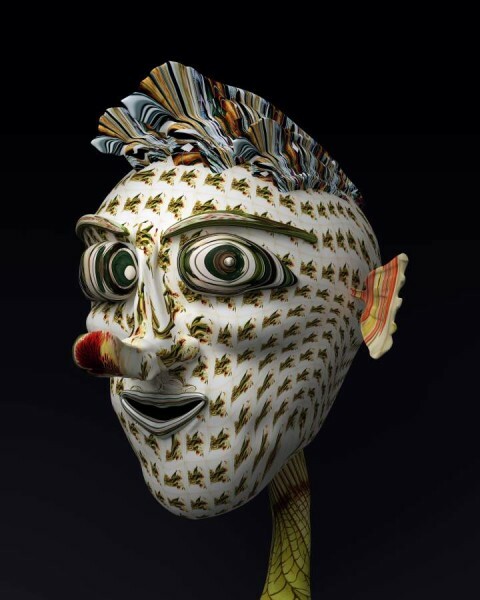 If one knows that the nose of the figure is at the beginning of the list, one could avoid changing data in that area if the object was to preserve the original form of the nose. Now that you’ve finished this first section, move on the the second set of notes, here. After years of neglect, I’ve revived my ancient website. I’ve given in to convenience.. no more hand coding.. just standard blog software.. so, hopefully, the ease of it all will result in more frequent updating..